Lot Detail - Nice Image of "The Jersey Lily"
Nice Image of "The Jersey Lily"
Albumen photograph of “Mrs. Langtry” 3-3/4”x5-1/2” published by W&D Downey of London. Fine condition. 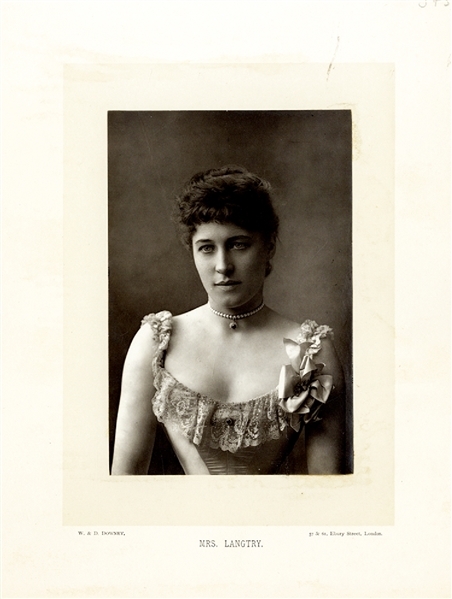 Emilie Charlotte Langtry (1853- 1929), known as Lillie (or Lily) Langtry and nicknamed "The Jersey Lily", was a British-American socialite, actress and producer.